Bellas. A trip to Vegas can take a lot out of you. I got back from Cosmoprof NA a week ago and I’m still recovering. Long days, late nights and an overdose of all beauty everything will require a bit of an adjustment period! Finally I’m settled back down and I’m here to tell you all about Cosmoprof. It’s like nothing else I’ve been to before, and I’ve been to just about every conference in the beauty blogging game. Or so I thought. Cosmoprof is a whole ‘nother thing. A different scene altogether. There are bloggers there, but this is a business-to-business trade convention. Our panel, Beauty Gone Viral, was the only one that touched on online influencers in the beauty industry. Many of the other panels were on topics like marketing, packaging, and omni channel retailing. Like I said, business to business. But I do think that there is a real place and valid reasons for bloggers and entrepreneurs to put Cosmoprof on their calendar for 2016. Here are 5 things that I learned at my first ever Cosmoprof, so you’ll know what to expect when you go! So yes. HUGE. Overwhelming. Bound to be bigger and better attended next year. If you’re going to Cosmoprof, wear comfortable shoes because you WILL be doing a lot of walking. I hit 10,000 steps on my pedometer app every day of the conference. 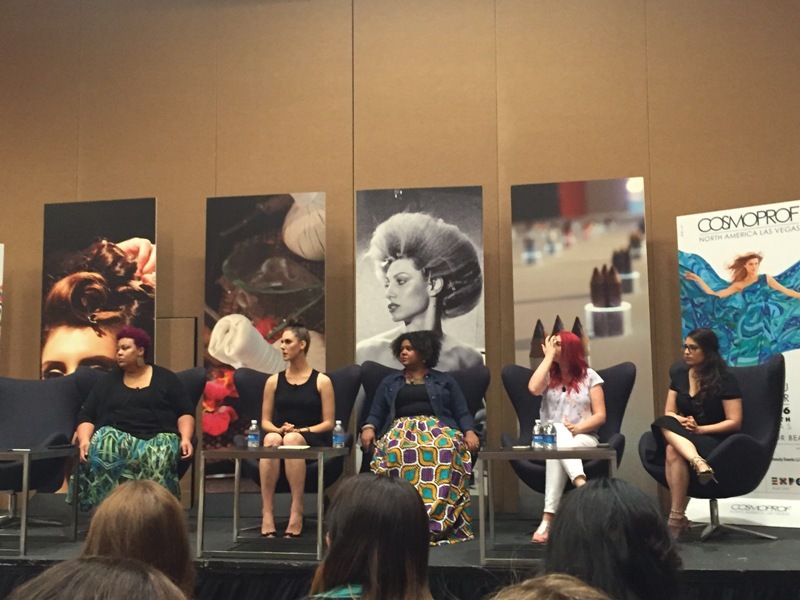 – Cosmoprof is where the creators and decision makers meet. At your standard beauty conference or blogging event you may meet someone in PR or who works as an official face of the brand. At Cosmoprof, the owners are there. The big investors are there. The behind-the-scenes decision makers are there, and much of the action is going on in private meetings and dinners. If you’re a hair or beauty blogger on the professional level, this is where you might meet those people and discuss potential partnerships. If you’re the creator of an up and coming indie brand, this next thing is for you. 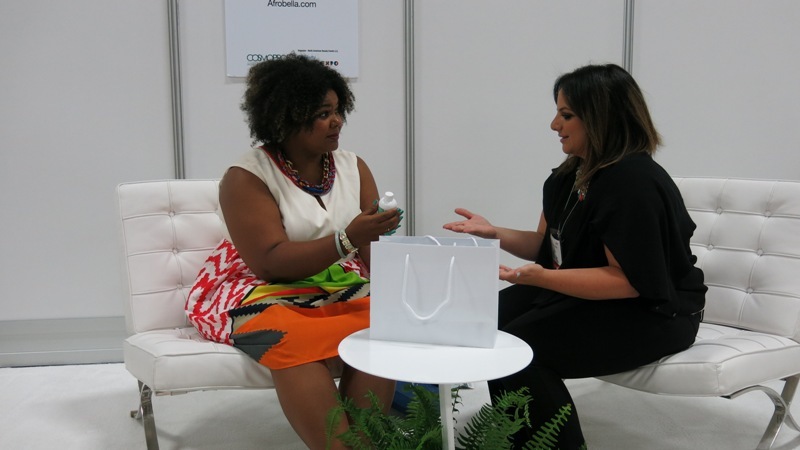 – Cosmoprof can be a great launch pad for a new indie brand…if you’re ready. I was so thrilled to see many indie brand creators I knew at Cosmoprof – some behind booths as part of the brand new Tones of Beauty showcase, intended to shine a light on multicultural beauty. I was in the BeautE Zone area across from there, and I got to meet SO many indie brand entrepreneurs that the best of them will be getting their own follow up post! Cosmoprof seems to be a great place to go just to get your brand seen by buyers and decision makers, and to see what the competition is up to. To learn from the best. To maybe make a connection with a retailer or e-tailer IF your brand is shelf-ready. Because there are SO so so many brands vying for your attention at Cosmoprof, you truly need to stand out. Your packaging needs to be on point, immediately eye catching and memorable. Your product needs to be ready and you need to be ready to be an engaging face of your brand. Everyone ain’t able and that’s real talk. But if you come correct and are prepared, you could walk out of Cosmoprof knowing your brand is about to go to the next level. – Cosmoprof is not a free-for-all. I think expos and conferences have gotten many of us used to goodie bags as a regular thing. I realized this at a recent book reading when a lady came up to me and asked in a whisper, “where are the goodie bags?” I was so confused. Anyway – at Cosmoprof there are products galore, but these brands are here to do business. Good business doesn’t necessarily equal giving all your products away. Having said that, many brand owners are generous and do want to generate press for their products. It’s about connecting and communicating, and following up after the conference. However I should have listened to the advice to bring an additional suitcase – being in the BeautE Zone meant connecting with a vast array of product makers and coming home with a whole lot of brand new, totally awesome products that I can’t wait to share! They’ll get their own post. And this is what I did for most of my time at Cosmoprof — connect with up and coming brands. Here I am with the creator of adorable nailpolish brand Ella + Mila. She’s such a sweetheart! It was so great, connecting with so many entrepreneurs. I left feeling so inspired and renewed in what I do! So those were my main takeaways and tips worth sharing. And for what it’s worth, here’s a quick and honest Cosmoprof NA FAQ! 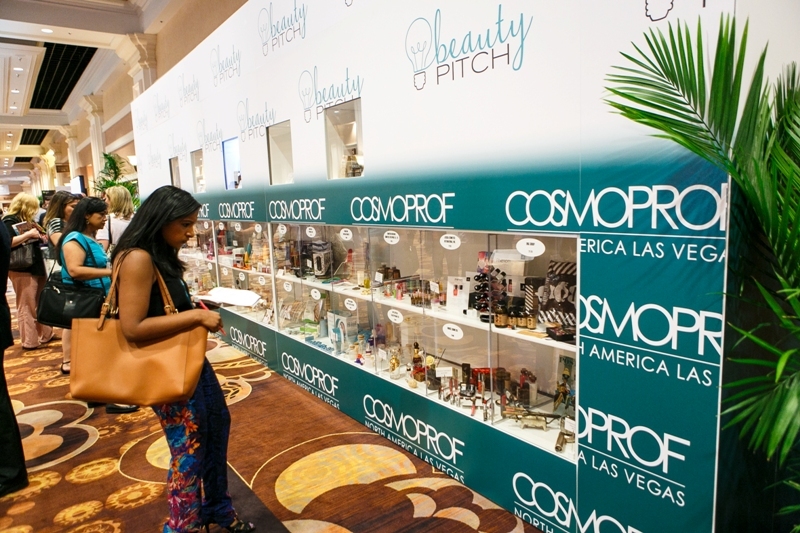 Q – What determines a booth location for a brand hoping to have their first booth at Cosmoprof? A – I reached out to Cosmoprof for an answer to this one. “The booth placement is handled by seniority and whomever has higher seniority get first right of refusal to locations. The only thing that is guaranteed, provided there is space and the exhibitor qualifies to exhibit, is the section they are placed in. It is separated out by the three areas of the floor: Professional Beauty, Cosmetics and Personal Care and Packaging, Contract Manufacturing and Private Label,” says Eric Z Horn, CMP Associate Executive Director, Business Development | Professional Beauty Association (PBA) Show Director | Cosmoprof North America (CPNA). Q – What should you expect to wear at Cosmoprof? A – I worried way too much about this. My best answer is comfortable, chic and polished. There were ladies in jeans and chic tops, and ladies who went a bit more dressy. A cute tee and a maxi skirt stood me in great stead. Also, a big but comfortable-to-carry purse to stash products, snacks, water, extra phone chargers etc. And flats. I mentioned that above, but I’ll say it again. You’ll be on your feet and walking a lot. Q – How should you pack for Cosmoprof? What should you pack for Cosmoprof? A – I fully support bringing two suitcases (I might even fly Southwest next time to avoid those charges). You’ll be busy all day and then there are evening events – sometimes with little time to change from day to evening. But it’s VEGAS, so evening events can be on the glitzy side. Don’t be afraid to turn up the makeup and/or the sequins and glitter. Because, Vegas. In terms of makeup, definitely primer and long-wear eye and lip color. Nothing that’s going to irritate your eyes or crease – it’s a long day and there may not be time for touchups. I don’t know about you, but wearing big faux lashes all day leaves me with tired and irritated eyes – and I saw that befall a few friends as well so this warning comes from experience. What else to pack? Lots of business cards. Got a lot? Bring more. Because you just might want to kick yourself if you run out. Q – Where should you stay for Cosmoprof? A – Obviously Vegas has a vast number of hotel rooms and there’s also just the fact that it’s VEGAS and a ton of different, fun things are always going on…but it’s wise to make your decision and book early. I’d recommend staying at the Mandalay Bay or the Delano, because they’re attached and it’s super easy to dart back to your room to stash stuff, recharge or just lay your burdens down for a moment. PLUS Michael Jackson One is at the Mandalay and it is EVERYTHING. Best Cirque du Soleil show I’ve ever seen, and I’ve been to five of them. And The Bathhouse at the Delano is AMAAAAAZING. You’ll want to book yourself a stress relief bath apres-Cosmoprof, trust. Q – Where should you eat during Cosmoprof? A – There was no food for sale in the convention center itself, but there is a food court right nearby, and a Starbucks and a little coffee cart – all of that was packed with beauty biz folks seeking sustenance. For a real, delicious meal and killer cocktails, Border Grill is the nearest and best spot. EVERYTHING there is SO good, I love that place! Further inside Mandalay Bay, there’s Citizens (popular breakfast and lunch spot), and Lupo by Wolfgang Puck which has delicious Italian food. You can find great deals on meals at the House of Blues spot, and Della’s Kitchen is the bomb for breakfast. If you want to be super fancy (or someone super fancy is taking you to dinner), book a table at Aureole. Q – Would you go back to Cosmoprof? A – I learned a lot and got a lot out of this first one, so I’m gonna say yes. I totally would, and I think it’ll be even better now that I know the ins and outs and have a better idea of what to expect! If you’ve been to Cosmoprof, please leave a comment with your best advice for those who are interested in going. 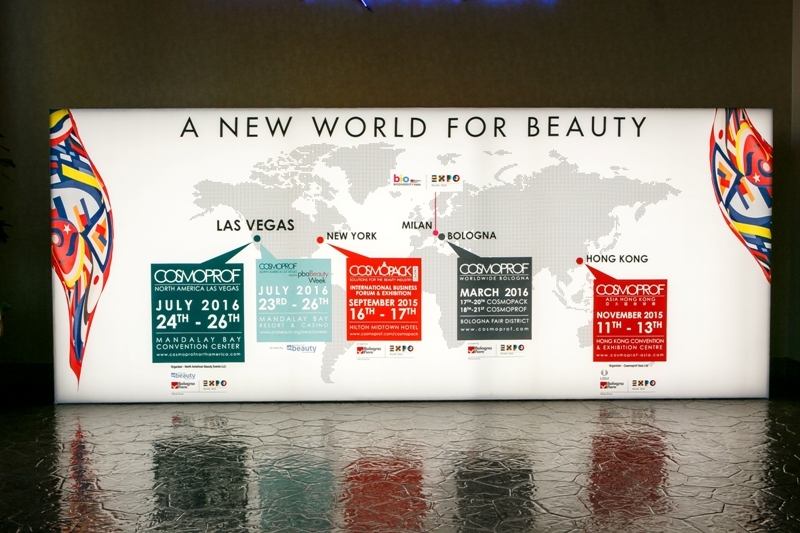 For more information on Cosmoprof, visit cosmoprofnorthamerica.com. « Black Beauty History–See The Valmor Products Exhibit + My Panel On Friday July 24! As usual, you have given your readers, prospective bloggers and beauty entrepreneurs a real 411 of how to conquer this major event. I can’t wait to learn more about the persons/companies you will spotlight in your next posts. I am happy that you have reached that level of influence in the industry and applaud the hard work and initiative that got you to this point – most people don’t realize how much work and input is required! Thank you for this! We plan to go next year. Not sure if we will be displaying or just attending but still this info is very helpful.